For travelers seeking something a little different, this former Dutch colonial outpost offers culture and luxury. WILLEMSTAD, CURAÇAO | The drive into the capital of Curaçao, the Dutch Caribbean outpost that is the “C” in the ABC islands, allows you to pass by the usual colorful privation of the Caribbean, tiny houses of cracked cinderblocks painted in bright corals and greens, the yards stripped of vegetation by goats and chickens, the homes interspersed with the roadside restaurants that serve as fast food, where workers in dusty boots queue up in front of barred windows for meat pies so rich grease runs to their elbows. Curaçao was “discovered” in 1499 by a lieutenant of Christopher Columbus and settled by the Spanish. A century-plus later it was captured by the Dutch and – barring a few back-and-forths – it has remained that way ever since, though it became an independent part of the Netherlands in 2010. The Dutch influence shows in the architecture, in the pinks and blues and shocking yellows of the businesses along the Sint Annabaai (the St. Anna Bay), which is reached across a floating pedestrian bridge that swings wide 30 times a day, so some 3,000 ships a year can pass into the harbor. Tourists sip drinks at tables along the water. Farther along are the floating fruit and vegetable markets, the Venezuelan vendors living and eating and playing dominoes and chess on their boats, forbidden by international visa rules from leaving the piers for anything but the restroom. Instead they make the 38-mile, eight-hour sail from their home country and stay for months, acting as barkers for their mounds of onions and plantains and limes, offering up a taste of passion fruit – go ahead, bite into the same piece the vendor was just chewing. Nearby, at Zus di Plaza, a restaurant without walls, women flip chunks of chicken and local flat bread and whole-eyeballed fish in giant dented pans over 10-burner stoves, the charcoal embers throbbing red hot. The food is flavorful, served up in scuffed Rubbermaid dishes and plastic bowls to locals and tourists sitting shoulder-to-shoulder at sticky picnic tables. The fort that kept this harbor safe is now a warren of shops, with street musicians and merchants of T-shirts and bubbleheaded turtles made of shells, whether local or imported from China. The souvenirs you need are here, along with a giant wooden shoe and a shop of Delft china, a nod to the forebears. Across the Schottegat harbor bay, long a refuge for pirates, is a giant metal recycling facility, where garbage trucks are crushed for scrap. Nearby workers cycle across the acres of the oil refinery – no vehicles are allowed – where the heaviest Venezuelan oil is processed. A century ago politics in Venezuela were untrustworthy, so the oil was brought here, where they still process 250 to 350 barrels a day, the cranes and pumps sharp against the sky. That industry has been surpassed by tourism, though, as the price of oil has dropped and the island’s reputation has risen. Finer restaurants like Blessing Curaçao offer mystery dishes with names like gebakken schol and snoekbaars, but also crispy tuna maki and steak tartaar. There is an evolving foodie culture and entire neighborhoods with outdoor dining under lights strung from trees. If you ask, the locals will point, they’ll draw maps in the sand, and they’ll enthuse about this cousin or that friend and their lovely food. The St. Tropez restaurant and resort, for example, is pure upscale Mediterranean, the coral reef walls of the old buildings offset with bright white architecture and semi-enclosed cabanas, their lounging beds encircling an infinity pool that drops off to the horizon. In the morning the coffee is rich, the croissants flaky, the omelets puffy and full. There is, as always, too much food. At night, it transforms into a pulsing night club, the young and the beautiful draped across chaise longues or floating in the azure pool as waiters deliver drinks, many of them made with Curaçao liqueur, the blue liqueur made here on the island from the dried rinds of the bitter native Laraha orange. That is the way of the islands, to take what is bitter and make it intoxicating. The liqueur is certified kosher. Curaçao was long a refuge for Jewish people fleeing persecution or looking to build businesses. Thus the oldest active Jewish congregation in the Americas is here, dating to the mid-17th century. The floor of the still-used Mikvé Israel-Emanuel Synagogue is covered thickly in sand, both to represent the 40 years spent wandering in the desert and as a remembrance of the need to muffle footsteps during the Inquisition, so the soldiers couldn’t hear the movements of the men worshipping inside. 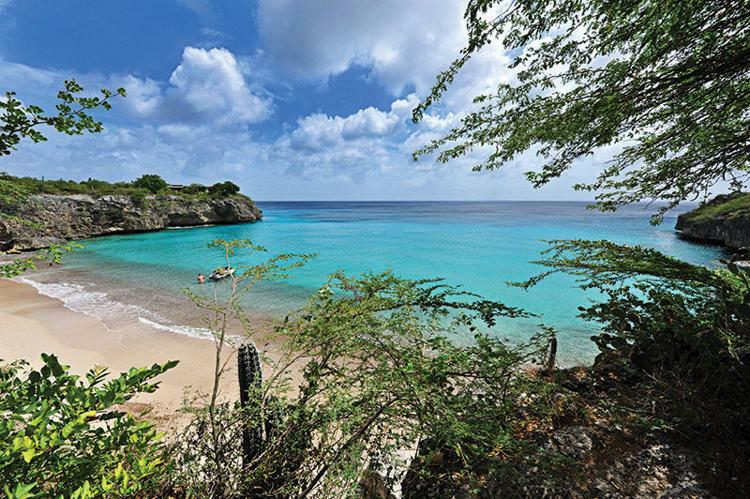 Curaçao presents the spectrum of beauty: the natural Mount Christoffel. When you tire of the city, hit the winding narrow road that leads out of town. The destination for the drive may be the Oasis Coral Estate Beach, Dive & Wellness Resort, but out here the journey is kind of the point. The road itself, lined with cacti and jutting rocks, leads past a flamingo-colored cathedral high on a hill, to actual flamingos wading in salt flats, their low stone walls built by slaves. Nearby is a whitewashed Willywood sign, a miniature version of the one found in Hollywood, and Willyburgers, a roadside dive with goat-meat burgers speared with a tiny Curaçao flag. On weekends locals come here to belt karaoke into the night. Things are slower here, away from the city. At the outdoor restaurant Trio Penotti, lizards skitter underfoot and the chef brings out a hand-written recipe for his famous African peanut soup, made famous, he says, by tourists like us. There are boats that will take you out across the sun-glinting water, flying fish tracking and soaring, to the prime snorkeling spots with their fish swimming in swirls and gyres, translucent, their organs showing. There’s a spot where you can duck under a rock overhang into a cave and dive down for lobsters, and another where you can snorkel where the sea turtles come to feed. In Willemstad, the Dutch and Spanish colonial influences are visible. Of course history is everywhere – in the residents, the food, the 1600s synagogue, the salt flats worked by slaves. On one side of the island are coves with white sand and cliffs where you can (but probably shouldn’t) jump directly into the sea. On the other is the National Park Shete Boka, a place of jagged rocks with waves crashing. When the tide is right you can clamber into a womblike cave as the waves rush in. It is cool there, out of the sun, with the risk of the seawater splashing in your face. Outside it are hundreds of cairns, the stones balanced carefully by generations of visitors. An iguana skitters by and disappears under a rock. Another wave crashes. The road has led us to the Oasis Coral, pristine and new, all white-tiled floors and clean lines, the landscaping perfect, the chairs around the pool arranged just so, all of it perched on the edge of the sea. It is the place to stop. To order a cool beverage from the attendant, put up your feet and watch the sun slide into the sea. To jump off the diving platform or swim out to the Anaconda Bob, the small boat that bobs on the turquoise sea, her orange life ring the only blip on the blue. Stay at Sonesta Kura or the Oasis Coral Estate: These two well-maintained luxury resorts offer the perfect jumping-off spots to take in everything Curaçao has to offer. Check out Go West Diving: If you want to enjoy the ocean, this group offers access to more than 65 dive and snorkeling sites. Visit Mikvé Israel-Emanuel Synagogue and its Jewish cemetery: The synagogue and its cemetery are the oldest of their kind in the Western Hemisphere. Eat at Blessing CuraÇao: This is the spot for succulent seafood and traditional Dutch dishes. Try a Willyburger: Goat burgers juiced up with green aioli and pickles, and sweet potato fries. Don’t miss these.